I’ll never forget the day I hooked into a massive pike on Kensington Lake in Metro Detroit. It was a beautiful fall day, and the sun’s soft rays shone beautifully on the red and yellow leaves atop the trees that lined the shore. This scene reflected onto the water, giving it an amber hue. The tranquility of the lake’s glass-like surface was shattered when a three-foot long (at least) pike chomped down on my Daredevle lure. “Fish on!” I shouted, even though I was the only one in the boat. While I was equipped with the best fishing gear I could afford, it was still an epic battle to land the pike. It fought hard to shake the lure out of its tooth-filled mouth. After a long and arduous battle that included some amazing runs by the fish, I finally got it into the boat. It was just then that a realized I didn’t turn on the live well. For those who don’t know (Cough! Stuart Sweet. Cough! ), this is a tank inside the body of a boat. It fills with lake water to become a place to store the fish you catch. An electronic device keeps this water aerated so the fish recover and survive. To turn the live well on, I had to walk to the back of the boat to flip a toggle switch. Wisely, I pinched the pike just behind its eyes, which paralyzes its moth and keeps it from biting. This unfortunately drew my attention away from the net that was under my feet. My right foot went into the net while my left foot stood on its webbing. As I went to take my next step, it pulled hard on the net, which caused me to fall forward and let go of the pike. What happened next was something out of a Three Stooges movie and I was all three of them. I fell to the deck and smashed my knee hard on the cooler. The pain was excruciating and I instinctively grabbed my knee with both hands. Once free of my Vulcan Death Grip, the huge pike flopped and jumped until it went over the side of the boat with a splash. I bellowed in pain and frustration, which echoed like a gunshot across the open water. Switch panel? What the heck is that, I asked. He motioned to a small panel of toggle switches mounted to the bridge of his boat. According to him, he wired his electronics into this unit, which gave him an easy way to turn everything on and off. He said if I had one of my boat, I could have turned on the live well with a flip of the switch at my bridge. I thanked him for his advice then fired up my boat motor. It was time to look for another spot that might give me a chance to redeem myself for the one that got away. The next day, I called a nearby marina and asked them if they had switch panels. They carried a few brands, so I drove there to check out their wares. Most of the panel switches they had looked like they belonged in a nightclub. These devices were high-gloss black and the rocker switches and faceplate were backlit in bright shades of green or red. All of these seemed a bit elaborate for what I needed. I told the salesman I just needed something to control my fish finder, live well, and boat lights. He recommend the four-position WeatherDeck panel from Blue Sea Systems and I’m glad he did. I could go on and on about the WeatherDeck panel’s many features. I’d rather tell you about its most important one, because it is what made this switch panel perfect for my boat. Blue Sea WeatherDeck panels can be mounted in any one of four directions. Since my control bridge isn’t very wide, my switch panel needed to be installed vertically instead of horizontally. Those other fancy, brightly lit switch panels are designed only for horizontal installations. If I would have gotten one of them, I would struggle to flip the rocker switches because they’d be sideways, and I’d have to strain my neck each time I needed to read the labels. The backlit switch labels on the Blue Sea WeatherDeck integrate with its versatile mounting system. These labels are small squares that are inserted next to the ends of each toggle switch. Whether you install the switch panel horizontally or vertically, these labels can be placed in a way that you can read them without tilting your head. 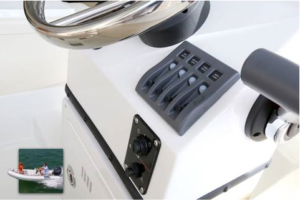 This shows that Blue Sea Systems took boat owners into consideration when its engineers designed this device. Some marine electronics experts say it’s easy for boat owners to install a WeatherDeck panel. When it comes to tinkering with anything, I’m worse than Tim Allen’s character on Home Improvement. Not only will I screw it up, I’ll do it in glorious fashion. When I read that 32 percent of all boat fires from 2009-2013 were caused by DC electrical issues, I knew this wasn’t the job for me. I had an ABYC-certified marine electrician install my WeatherDeck panel. Don’t let my bumbling nature scare you off from installing this yourself, though. 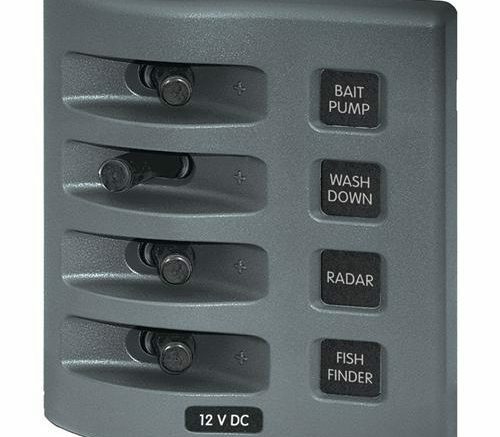 I’ve read that most boat owners with just a little handyman experience can install these switch panels very easily. When I came to work for Solid Signal, one of the first things I did was check out the company’s selection of marine electronics. I was impressed to see we stock the two-switch, four-switch, six-switch, and eight-switch models of Blue Sea Systems’ popular WeatherDeck panels. This device has helped me, and I’m sure that it would be a great addition to your boat, too. If you’re going to get a WeatherDeck panel, get the six- or eight-switch models from the start. You might think you only need “a few” electronic devices on your boat, but we both know you’ll add more over time. (I know I plan on it.) Getting a model with more switches than you need at first is future-proofing against this being a problem later. Want to know more? Give us a call at 877-312-4547 and we’ll answer all your questions about Blue Sea WeatherDeck panels and other marine electronics.